FreeKB - Resolve "Thunderbird failed to find the settings for your email account" Resolve "Thunderbird failed to find the settings for your email account"
This error appears when attempting to set up a new email account in Thunderbird. Let's use an example where Postfix is the SMTP server and Dovecot is the POP3 / IMAP server. On the Postfix/Dovecot server, ensure both Postfix and Dovecot are active and running. On both the email server and client, ensure the appropriate ports (25, 143, 465, 587, 993, 995) are open in iptables or firewalld. On the client, use ping to ensure you can get a response from the mail server. On the email server, ensure john.doe exists in the /etc/passwd file. On the email server, use the passwd command to ensure the password is correct. On the email server, in the /etc/postfix/main.cf file, set inet_interfaces to all, to allow remote hosts to be able to connect to the Postfix server. If the email server is configured to use SMTPS, ensure you can make a SMTPs connection to the Postfix server. 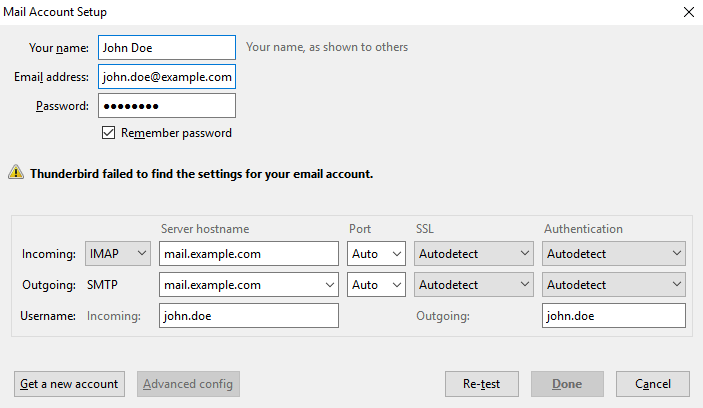 If the email server is configured to use POP3S or IMAPS, ensure you can make a POP3s or IMAPs connection to the Dovecot server.